Professors overwhelmingly praised a proposal to renew the College’s General Education program—a drastic overhaul of the curriculum previously deemed “failing on a variety of fronts”—at the semester’s final meeting of the Faculty of Arts and Sciences on Tuesday. Drafted by the Gen Ed review committee chaired by Philosophy professor Sean D. Kelly, the proposal outlines a Gen Ed program that would include distribution requirements, fewer but consolidated general education courses, and one quantitative-based course. Kelly, who described the program on Tuesday as a “penultimate draft,” said the committee will finalize legislation for the program next month. Faculty members will likely vote to approve it in the spring. At the meeting on Tuesday, a handful of faculty members offered their feedback on the proposal, each prefacing their remarks with praise for the committee’s work. Several professors said the new program clarifies Gen Ed’s three central aims: to prepare students for a life of civic engagement, teach them about a range of disciplines, and give them flexibility in their academic schedules. University President Drew G. Faust’s senior special assistant, Lars P.K. 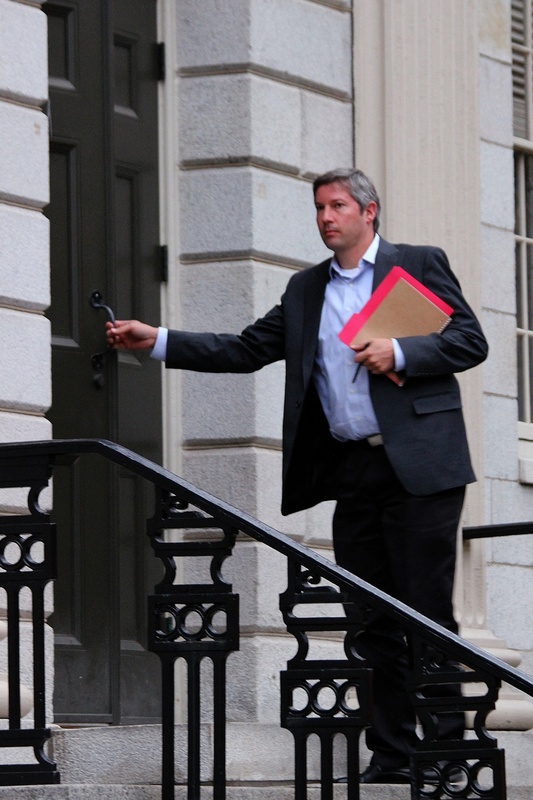 Madsen, enters University Hall before the December faculty meeting. 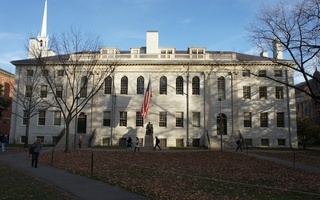 Still, some faculty members suggested additions to the proposal. In particular, they argued that the new program should not abandon the current mandate that students take a course that engages significantly with studies of the past. Music professor Vijay Iyer also suggested that the new curriculum include courses that focus on or cover topics of diversity and inclusion, a request that echoes a recent College report that called for the Gen Ed program to recruit faculty members to teach courses on diversity. In response to those concerns, Kelly cautioned against creating Gen Ed categories that are too narrow, arguing that they would not be effective. “We thought the program would have a better chance of standing a longer time if we had the requirements at a sort of meta level,” Kelly said. “The more we add details to the program, the more we fear we undermine the identity and make it harder to understand what the program is about,” he added later. The Gen Ed proposal also recommends that administrators increase financial support for the program. Faculty discussion on Tuesday did not focus on that point, but after the meeting, Philosophy professor Edward J. Hall described the issue of administrative support as key to the success of a new program. “What’s going to be crucial in the next few months is seeing what kinds of resources the administration can bring to bear,” said Hall, who is also chair of the Gen Ed committee. In an interview, FAS Dean Michael D. Smith said he is unsure how much money the new program will require. 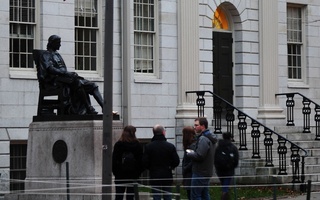 Given the newly definitive proposal, though, Smith said he will begin to speak with potential donors about Gen Ed more specifically as he fundraises for Harvard’s ongoing capital campaign, now in its third year. Speaking to the new Gen Ed program’s timeline, Smith said he expects that it “would be difficult” to implement it by next fall, given associated administrative changes. The Gen Ed review committee will draft legislation on the new program to distribute to faculty in January, Smith said, and they will not vote on the program until at least March. 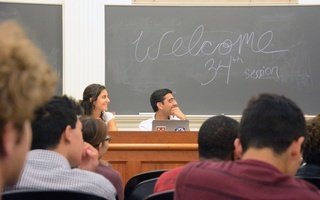 Also at Tuesday’s meeting, faculty heard from Dean of the College Rakesh Khurana, who informed them that the masters of the College’s 12 residential Houses had unanimously agreed to change their title, which students have criticized as associated with slavery. Human Evolutionary Biology professor David R. Pilbeam also presented a report on behalf of a committee studying the importance of student body diversity, separate from another report on diversity that the College released late last month. Faculty members will vote on whether to endorse the presented report’s conclusions “as a statement of values embraced by the Faculty” at its first meeting of the spring semester in February. —Theo C. Lebryk, Jonah S. Lefkoe, Sruthi L. Muluk, and Leah S. Yared contributed to the reporting of this story. ​Once the Faculty approve a new program in General Education, all students will choose Gen Ed courses from the same, revamped offerings, according to Dean of the Faculty of Arts and Sciences Michael D. Smith.